As a member of this barbecue community, you probably buy a lot of meat. And when you do, you may have lots of questions: Should you buy Prime or Choice? Wet-aged or dry-aged? Here’s how to speak with your butcher so you sound like you know what you’re talking about. The USDA (United States Department of Agriculture) grades beef according to tenderness, texture, and “marbling”—the distribution of intramuscular fat. (Remember this equation: Fat equals flavor.) There are eight USDA grades, but two, Prime and Choice, are the most likely to turn up at your local market. Prime designates beef of the highest quality with the best marbling. The USDA uses a complicated inspection system that evaluates the marbling in the rib eye muscle but factors in the age of the animal. (As with much in life, younger is considered better.) Only 2 percent of all American beef is graded Prime, and most of that goes to restaurants and specialty meat markets—or to high-end Internet purveyors like Allen Brothers or Lobel’s. Do you need to buy Prime? No, but when it comes to steak, you’ll definitely taste the difference. Splurge if you can for a special occasion. Choice is the grade generally sold at supermarkets, and because meat classification guidelines are fairly subjective, it can be adequate, good, or very good. Choice beef is fine for braised or other slow-cooked dishes (it would be a waste to use Prime in these). I’ve also had many tasty Choice steaks over the years. Unlike vegetables and shellfish, which taste best the moment they’re harvested, beef needs to be aged to develop its tenderness and flavor. This can be done one of two ways: by wet or dry aging. Wet-aged meat is vacuum-sealed in plastic and stored under refrigeration for a few days or weeks to allow the natural enzymes to tenderize it from within and deepen its flavor. 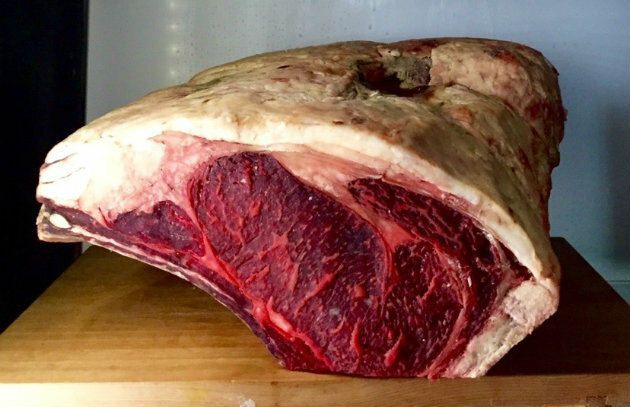 There is no shrinkage as there is in dry aging, so wet-aged meat costs less. Dry-aged meat is hung or racked in a walk-in refrigerator with a controlled temperature, humidity level, and air circulation. Over the two to four weeks (or even longer) of dry-aging, enzymes in the meat tenderize it and deepen the flavor. Some of the water in the meat evaporates, further concentrating the taste. But because the meat ages unwrapped, the exterior dries out and must be trimmed off and discarded, so as much as 35 percent goes to waste. Time and shrinkage cost money, so dry-aged beef is considerably more expensive than wet-aged. It’s definitely worth the splurge. Beef comes in a staggering array of cuts: familiar steaks like T-bones and rib-eyes. Lesser known cuts, like flatirons, culottes, and baseball steaks. Click here to see our favorite familiar cuts. Click here to see our favorite “new” cuts. If you’ve heard me say it once on Project Smoke, you’ve heard me say it a hundred times. 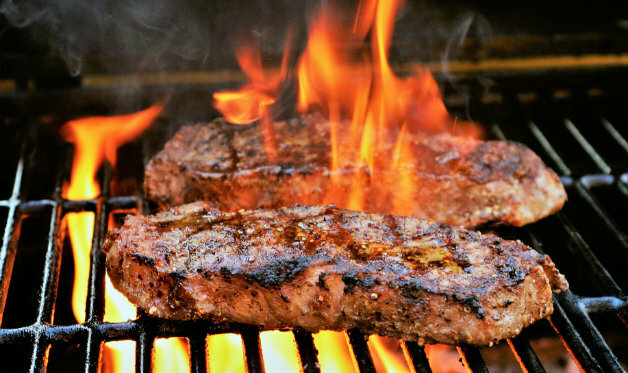 Where your meat comes from and how it’s raised matters as much as how you grill or smoke it. In my house we try to use beef that’s organic, grass-fed or non-GMO grain-fed, or local—ideally all three. Do YOU have a favorite cut of steak? How about a favorite way to cook it? Let us know on the Barbecue Board or on Facebook. Adapted from Man Made Meals.